The dean of the Cathedral of All Saints, the Very Rev. 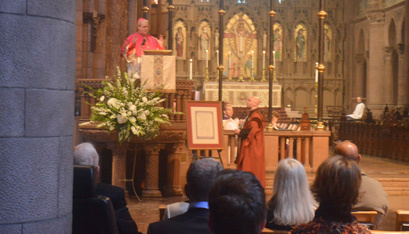 Dr. Leander Harding, reads the covenant with Bishop Edward B. Scharfenberger recalling the 31-year-old relationship between the Cathedral of the Immaculate Conception and the Cathedral of All Saints. Also in attendance was Episcopal Bishop William Love. Bishop Edward B. Scharfenberger preaches Oct. 14 at the Episcopal Cathedral of All Saints in Albany at a Choral Evensong for the feast of Our Lady of Walsingham. On Oct. 14, the Roman Catholic Diocese of Albany celebrated the feast of Our Lady of Walsingham with a special neighbor: the Episcopal Diocese of Albany. 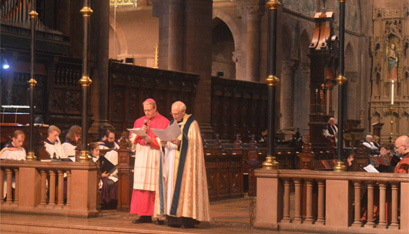 The day was celebrated with a Festal Evensong, an evening prayer ceremony common in Anglican tradition, at the Episcopal Cathedral of All Saints in Albany. The event was also a celebration of the 31st anniversary of the covenant between the Cathedral of Immaculate Conception in Albany and the Cathedral of All Saints. “We cherish our covenant relationship with our Roman Catholic brothers and sisters,” said Rev. Dr. Leander Harding, the dean of the Cathedral of All Saints, in a greeting to those in attendance. Bishop Edward B. Scharfenberger, who delivered the sermon, and said it was “a pleasure and blessing to receive and accept this gracious invitation” to speak at the Festal Evensong. The service was sung by the All Saints’ Choir of Men and Boys, the oldest performing choir of its kind in the country. Devotion to Mary under the title of “Our Lady of Walsingham” is shared by the Anglican/Episcopal, Roman Catholic and Eastern Orthodox faiths. The devotion is based on one of her earliest-known apparitions: In 1061, Mary appeared to Richeldes de Faverches, a noblewoman in Walsingham, England, and instructed her to build a replica of the “holy house” in Nazareth where the Annunciation had occurred. The Walsingham site became a shrine, with pilgrims flocking there and claiming to have experienced miracles. Today, Roman Catholics, Anglicans and Orthodox Christians all maintain chapels in Walsingham. Since the inception of the covenant between Albany’s two cathedrals, a devotion to Our Lady of Walsingham has been offered each year at the Cathedral of All Saints, with members of both faiths invited to attend. The covenant between the two cathedrals was a product of a close friendship between Bishop Emeritus Howard J. Hubbard of the Roman Catholic Diocese and Bishop David Ball of the Episcopal Diocese, who passed away last year. The covenant promises the two faiths will gather together for events centered around prayer, faith formation and socializing. In the past, the cathedrals have offered joint pet blessings, Stations of the Cross and shared meals in Lent. Bishop Scharfenberger and Dean Harding took turns reading the original proclamation of the covenant between the Cathedral of the Immaculate Conception and the Cathedral of All Saints, reinforcing the commitments made to one another over 30 years ago. Each of the cathedrals promised “to pray for one another; to worship together occasionally, including an annual commemoration of the signing of this document; to hold educational programs for our people for the purpose of mutual understanding; to work together for social justice and the common good; to sponsor jointly cultural and social events” and more. Bishop Scharfenberger went on to discuss the many titles bestowed on Mary, who is known as a symbol of hope and unity. One of his favorite titles for the Blessed Mother is, “Undoer of Knots,” because of her ability to help “untie” difficulties in the world. Once again, Mary was helping to unify her people by “bringing our churches together” in celebration at the Festal Evensong, noted the Bishop. After the service, everyone was welcome to stay and enjoy refreshments in the back of the church. David Smail, an Episcopal church-goer, told The Evangelist he liked Bishop Scharfenberger’s message about how small things may be what separates different faiths. “We get hung up on traditions, but we’re both worshipping the same God,” Mr. Smail said.